Don't you love awards season? There are plenty of golden statuettes to go around, whether you're talking movies, TV, pop stars, directors, writers, whatever. Probably the biggest party among the recent shows were the Golden Globes, given out on Sunday. And that was a pretty awesome party all around. Tina Fey and Amy Poehler were fabulous. Also funny and fresh and cool, but mostly fabulous. So what happened? Jodie Foster got the Cecil B. DeMille Award for her contributions to cinema, offering an acceptance speech that some found infuriating, some found inspiring, and others found confusing. Oh well. She got her award and she looked great, so I guess we're clear on that much. In more surprising news, Argo and director Ben Affleck upset the Lincoln applecart, with Affleck taking Best Director and the movie being named Best Drama. 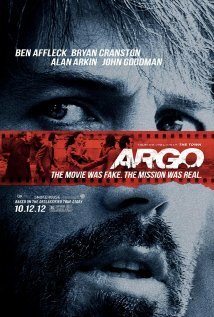 It was a good week for Affleck, who also won the Critics Choice Award for Best Director, with Argo named their Best Picture, too. Was it a little payback for Affleck's direction not even getting a nomination from the Academy? Who knows? But it was fun! Lincoln's Daniel Day-Lewis won the Golden Globe for Best Actor in a Drama, while Jessica Chastain took the Drama Best Actress honors for her role as a CIA agent on the trail of Bin Laden in Zero Dark Thirty. Those two also won with the Critics. Are they frontrunners for Oscar? Yeah, probably. They were matched on the Golden Globes' Comedy/Musical side by Hugh Jackman, who won for playing brave and virtuous Jean Valjean in Les Misérables (which is certainly no comedy) and Jennifer Lawrence, half of of the off-kilter dancing duo in Silver Linings Playbook (which certainly is a comedy). Aside from the overall Best Pic, which was Argo, the Critics Choice awards divide their favorite film choices into Comedies, Action Movies and Sci-Fi/Horror, and they singled out Silver Linings Playbook, Skyfall and Looper. Jennifer Lawrence was their winner for both Action (The Hunger Games) and Comedy (Silver Linings Playbook), while Daniel Craig (Skyfall) and Bradley Cooper (Silver Linings) took honors among Action and Comedy actors. Science Fiction/Horror actors get no love at all. Supporting actors honored by the HFPA were Anne Hathaway, who played Fantine in Les Miz, and Christoph Waltz, as the dentist/bounty hunter/magic wizard in Django, while the Critics went with Hathaway and Philip Seymour Hoffman, who played the cult leader in The Master. Along with the awards for Jackman and Hathaway, Les Misérables also took the Golden Globe as Best Motion Picture (Comedy or Musical). Oddly, the Foreign Press Association honored neither Les Miz nor Argo, not even Lincoln and Pulitzer Prize winner Tony Kushner, for its screenplay. That award went to the always annoying Quentin Tarantino for Bloody Bloody Django Unchained. (The "Bloody Bloody" and the "always annoying" are my contributions and not part of anything to do with the Golden Globes.) And yes, Tarantino was also the Critics Choice for Best Original Screenplay, while Kushner got Best Adapted Screenplay to go with all those Tonys, the Emmy, the Olivier and the Pulitzer. 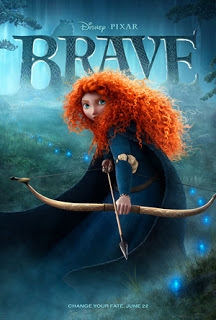 Other films taking home the hardware were Brave, named Best Animated Feature Film by the Hollywood Foreign Press -- the Critics chose Wreck-It Ralph -- and France's Amour, which won as Best Foreign Language Film from both the HFPA and the Critics. On the TV side at the Golden Globes, Showtime's Homeland was the big winner, taking Best Drama, Best Actor for Damian Lewis, and Best Actress for Claire Danes. HBO's Girls won Best Comedy, with star/creator/writer/Ms. Everything Lena Dunham named Best Actress in a Comedy. Don Cheadle, the lead in the Showtime series House of Lies, won as Best Actor. HBO's Game Change, all about Sarah Palin and her Vice Presidential run, emerged as the winner in the Mini-Series or Motion Picture Made for Television category, with Julianne Moore, the one who played Ms. Palin herself, named Best Actress. Kevin Costner took Best Actor honors for Hatfields & McCoys, a mini-series that aired on the History Channel. Best Supporting actors in All of Television were Downton Abbey's Grande Dame Maggie Smith and Game Change's Ed Harris, who played presidential aspirant John McCain. And now the important stuff! Who looked the best? Among the ladies, I liked Amy Poehler's fun faux-tuxedo, which fit her personality perfectly, I thought Claire Danes looked terrific in red, and I also liked Naomi Watts' garnet gown. 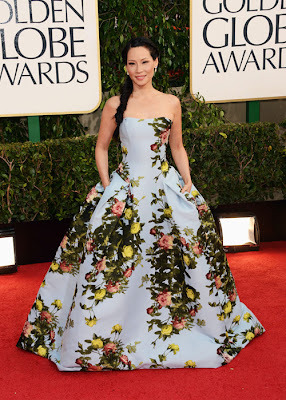 But Lucy Liu (above) was amazing in a flowered Carolina Herrera gown that didn't look like anybody else's. Unlike Connie Britton and Isla Fisher, who looked like the same person. Same color, same hair... Which is which? Can you tell? And now it's on to more awards and more gorgeous gowns, as we wind our way through SAG, BAFTA and Oscar season. It feels like it lasts forever, but it's really just two months. Okay, maybe three. I loved Lucy's gown but one website included her among the "worst" in their Best & Worst list. Disagree! I saw her listed as a Worst, too, and I totally don't get that. Plus Jennifer Lawrence's weird gown with the cuppy/cat-eyes bodice was a Best, and I pretty much HATED that one.